On November 13, 1919, a couple of hundred protesters gathered on the steps of City Hall to air their discontent with the city's compulsory vaccination program. 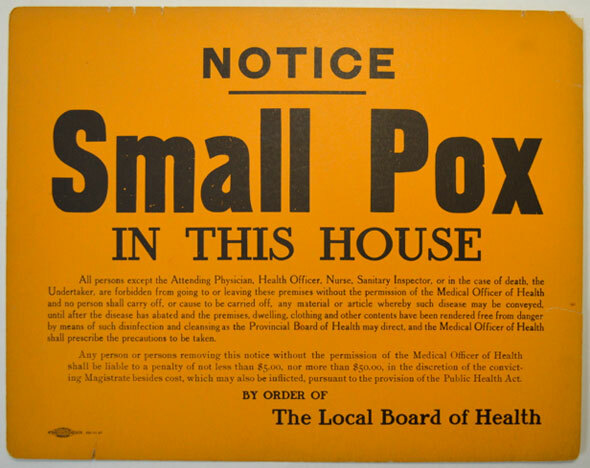 Since 1914, Toronto had been allowed by the province to vaccinate school children against smallpox in the event of an outbreak, with or without the permission of parents. The organizers of the rally, the Toronto branch of the Anti-Vaccination League, had been active for at least 20 years prior to the event. Their notices first appeared in the classified sections of newspapers alongside ads for "pretty, wealthy Canadian girls" looking for husbands and gypsy astrologists. Some notices advocated for homeopathic vaccinations. "Homeopathic practice is admitted to be very efficient in curing every form of disease, while their medicines are the antithesis of the crude drugs used by [then-Toronto Medical Officer of Health] Dr. Sheard and co.," a reader wrote to the editor of the Toronto Daily Star in October, 1901. The smallpox vaccine was first developed in the late 16th century by English doctor Edward Jenner. In 1796, the rural physician tested reports that dairy workers had become immune to smallpox after suffering from cowpox, a similar but considerably less lethal disease. By injecting humans with live cowpox, Jenner was able to trigger an immune response that protected the patient against smallpox, one of the great killers of the time. Jenner also coined the term vaccine from the Latin word "vacca" for cow. In the early 1900s, the Anti-Vaccination League stoked fear of immunization by conjuring images of unsanitary animals and horrific side effects. One mother claimed her blind son, who was told by doctors he might recover, had had his hopes dashed following immunization. 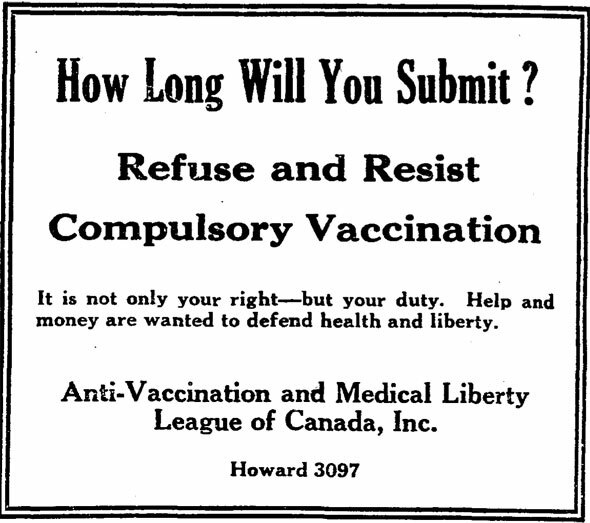 In 1919, shortly after the end of the first world war, the anti-vaccination movement returned to the scene following an epidemic of smallpox that resulted in 2,800 infections. As a result, Dr. Charles Sheard, Toronto's Medical Officer of Health that year, ordered children receive compulsory shots, much to the League's disgust. "Vaccination is simply the old scientific absurdity of using disease to fight disease," J. W. Nimmo from the League told a meeting in Earlscourt. Dr. Henry Becker, a prominent homeopathic doctor, claimed vaccines were "made from the grease taken from the heels of horses, from swine pox, and even from dead bodies." This was untrue,Toronto's vaccines were produced at Connaught Laboratories near Steeles and Dufferin from specially kept cows. Among the most prominent opponents to compulsory vaccination were Mayor Thomas Church and Controller Sam McBride. After being told a similar immunization policy in Germany had still resulted in thousands of smallpox deaths, McBride said it was "a pity they weren't all vaccinated. We should have fought them with vaccine points instead of bayonets." Dr. Sheard said opposition to compulsory vaccination was "absurd" and "puerile." Nevertheless, the protestors on the steps of City Hall that November urged aldermen to "stop the slaughter of innocents." The city eventually acquiesced and ended compulsory vaccination, but not before the 1919 outbreak had been largely contained. Today, parents are still allowed to opt out of vaccinations.